Regional Technical Manager Robbie Rodgers, left, and Senior Vice President Jeffrey Barker were among a group of 31 Xerox employees at the recent RIT-Xerox program in June. Since its inception, more than 130 managers have participated in the customized online program that combines coursework from service management to printing industry trends. There is a short distance between senior vice presidents and front line managers in the RIT-Xerox degree program—even when they are online. Xerox Corp. has some of its future leaders learning alongside some of its current leaders in the Rochester Institute of Technology-Xerox degree program. Participants such as Senior Vice President Jeffrey Barker and Regional Technical Manager Robbie Rodgers talked with classmates about how the program is helping reap benefits for both the employees involved and the company. Barker and Rodgers are part of the RIT-Xerox degree program, now in its fifth year. It is a customized online program that combines coursework from service management to printing industry trends. Based in the RIT Center for Multidisciplinary Studies, the program is more than a training program, with students earning degrees, not just certifications of completion. The credential provides professional growth opportunities for the students and provides the company with a workforce that can compete in today’s competitive business landscape, says Barker. In the RIT-Xerox program, students can earn associate and bachelor’s degrees with concentrations in management and printing services. Students are required to take 18 courses over a two-year period, participate on-site at RIT for two weeklong seminars and deliver a capstone project based on a specific workplace issue. “Xerox students bring work experiences and personal insights to every class. They also develop a strong bond in their cohort and support each other throughout the program,” says Tom Hanney, a lecturer who teaches courses in the program and co-leads the capstone process. 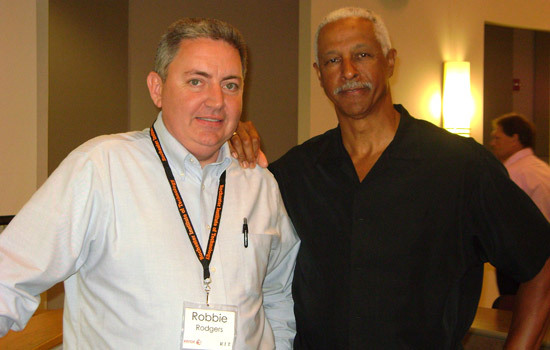 Barker and Rodgers were among a group of 31 Xerox employees at the recent on-site session in June. All were from different business units and at varied levels of management, including three senior vice presidents. Both Barker and Rodgers acknowledge that the business climate has changed. Customers demand more than products and repair support from the international corporation that continues to evolve from manufacturing office products to providing broader professional business services. They expect the organization to provide strategic administrative support and products that align with the company’s business. Since its inception, 133 Xerox managers have participated in this program, with 67 having already graduated. “The support and commitment that the Xerox learning and development group puts behind this is remarkable,” says Kitren VanStrander, RIT director of outreach education and training. Barker and Rodgers expect to complete their bachelor’s degrees in spring 2012. A new cohort of students will begin this fall with this current class expected back next spring to present capstone projects based on service issues and improvements plans they’ve researched and developed.